One way to keep your dog happy and put a smile on his face, is to give him a bone. Another way to put a smile on your customer's faces is to give them a stress toy shaped as a dog bone. They will laugh all the way home. When they are stressed out, they can bash it around for a while and feel so much better after they have got rid off all that pent up tension. Stress is major cause of heart attacks, strokes and other medical problems and you can do your bit as a company to help reduce stress levels in the workplace and in the home. The toy features a classic dog bone shape with a long centre piece and knobbly ends that are perfect to chew on. It comes in a light colour, ideal for highlighting your company image. 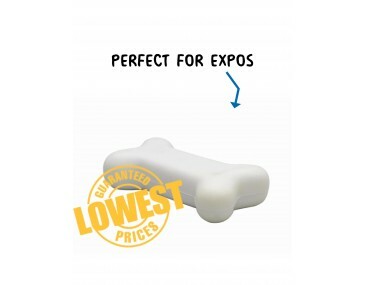 Delight your clients when you brand your company logo and graphics onto these fabulous stress bones. They make great freebies at trade shows, corporate conferences, school and college events. Any business in the pet industry, pet food, animal care centres and dog training businesses will create a fabulous advertising campaign with these stress balls. Speak to us, our listed price includes branding of your logo or graphic in a single colour print onto the ball. We offer a product turnaround time of two weeks, but we can offer even faster turnaround times for urgent orders. This product is supplied in bulk quantities. Please note that our prices exclude GST and a print set up of $75 applies.